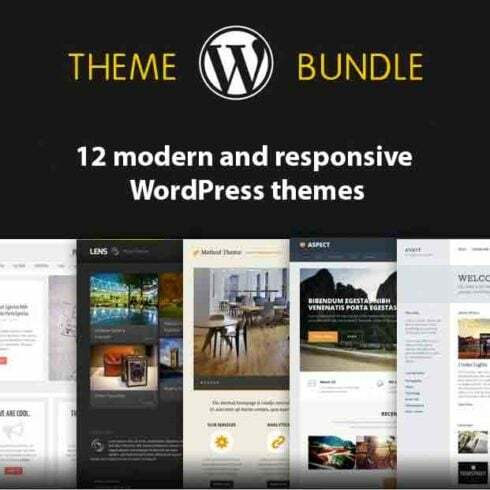 With this bundle, you’ll get 12 modern and responsive WordPress themes with a value of $1.188, for only $29. Caboom is a flagship, top-selling theme on 7Theme. A powerful multipurpose WordPress theme for any kind of website. Chili is a responsive restaurant WordPress theme. Perfect for any kind of restaurant and food website. Cleanextreme is a cleaning company WordPress theme. Unique design and endless possibilities. Cortina is a great designed hotel WordPress theme. A perfect solution for any kind of hotel, resort and holiday website. Crumbs is a bakery WordPress theme. If comes with a fresh, clean and unique design as well with endless features. Prestige is a top-selling real estate WordPress theme, made for high-class properties and luxury estate agencies. Goldencare is a beautiful nursing home WordPress theme. It comes with more than 500 theme options and countless other features. Inbalance is a modern and unique yoga WordPress theme. It is 100% customizable, responsive and easy to use. Meet this great looking moving company WordPress theme. Justmoved is a perfect solution for any kind of moving company. Justness is a classical lawyer WordPress theme. Loaded with countless features, responsive design and many more. Lingua is an interpreter WordPress theme. You can customize the theme with more than 600 theme options. Responsive & unique design. Medpark is a medical WordPress theme, perfect for any kind of medical websites like dentist or surgery. As you can see, this year, website templates are just about everywhere. Moreover, big businesses tend to start their webpages with these popular products. So, what is site theme and why do you might need to have it? For starters, web template (or website theme) is a group of pages, modules, and UI kits. Each of the layouts a theme comes with are pre-made and properly featured. Additionally, these ready-made solutions are versatile, as a result you are able to tweak every layout, each individual color, and every pixel without trouble. Speaking about the quality site templates, they are code-free as well. Consequently, a user receives their design just out of the box without writing a single line of program code. In addition, the product comes with all the must-have functions and the popular design elements simultaneously. What’s more, opening the package of a professionally made site template, a user will discover there high quality plugins. And these are just for starters! To sum it up, a first-rate site template is your chance to create the project easily and without spending all of the funds. Remember that these templates are much more than the dull designs with a poorly elaborated navigation! Truthfully talking, such solutions are exceptional as a result of an inbuilt editor that allows you to adjust the web pages up to your business style or individual taste. For anybody who is on the lookout for an easy way to start an up-to-date website, here’s what you need! Currently, WordPress is one of the most popular CMSs to operate a website. This year, WP platform covers nearly 40 % out of all the websites, so why is it so favored? To begin with, WordPress platform provides its users with a whole stress-free website development experience. You will not need any particular skill to start up a decent website by using ready-made WordPress template. These skins can be used by users of all skill levels. To put it simply, using a WP template for WordPress, you end up with an actual What You See Is What You Get feel. By using it, it is possible to make new web pages, customize them, and change any feature with ease because of a integrated content editor. It comes with any WP theme. On top of that, there’s a real time preview, which means you will avert most of the common issues. However, WP isn’t just a powerful platform to run a website. It’s a resource for top notch digital products for web developers. As you may already know, WordPress also offers the audience to make use of different free digital items. The list of these offers contains templates, extensions, typography, addons, etc. Anybody who doesn’t have a lot of experience can get numerous instructions available on the web. At last, making use of WordPress, you can find a theme for pretty much any business niche! It will consist of only the functions your corporate website actually needs and, undoubtedly, there will be some website design elements in the pack. On top of that, WordPress platform usually provides its clients with costless update versions that include automatic set up. For starters, all the WordPress Website Templates are generally known as themes. In actual fact, the primary part of this products is multifunctional. It implies that you are able to create a wide range of websites for various businesses using only one skin. It can be useful not only for site owners but for website developers too because you are able to create as many sites as you need. Talking about the tech side, premium WordPress theme are simple-to-use, fully user-friendly and really simple in editing. Still, which options you can discover downloading the bundle of a WordPress web template? Clearly, the pack of a thoroughly picked WordPress website template contains all the must-have options. Firstly, there’s a responsive layout that helps your website perform flawlessly on any device no matter which display dimensions it comes with. Additionally, there should be a mobile-friendly design to make all the important areas scrollable from mobiles. Thirdly, bear in mind that your website undoubtedly requires such necessary capabilities as crossbrowser compatibility and Google-friendly program code. A result of the integrated SEO, Google, Yahoo, as well as other search engines will promptly discover your site among other online projects. Then finally, contained in the pack of WordPress web template, you will discover numerous styles for blog and portfolio to choose from. These days, maintaining a modern day blog is still a great strategy to establish devoted relationships with the customers. With its help, you can share all the information like future giveaways and new arrivals. Besides, you will find newsletter subscription option to keep your viewers interested. Needless to say, you will get loads of readable web fonts and easy on the eyes icons to improve your content and these are just a small part! Undeniably, in 2018, you need to have a handful of cool options to stay ahead of the crowd. For these simple factors, these WordPress themes come with various stylish features. For instance, there are numerous counters, (such as Countdown Timer that is a marvelous way to showcase an offer or sale) charts, accordions, progress bars, and much more. As a bonus, WP templates include fabulous visual effects. There’s a favored Parallax Scrolling, which lets you generate eye-catching and neat backgrounds. Making use of the function, you will guide audience through the articles and other content of the site in an interactive way. Furthermore, all the premium WordPress themes come with popular plugins inside. They provide a site with comfy and user-friendly interface. It’s an important factor assuming you want the website to be a well-known place. There’s MagaMenu plugin, that allows website owner constructing attractive menus of any complexity. Working with the feature, you can separate the products or pages using categories and subcategories if necessary. Among the other characteristics that will improve the navigation of the site, there are things like sliders, sticky menu, sticky header, widgets, Ajax-based search, and much more. And if you would like to see how a template looks before purchasing it, there’s usually demo preview offered on the product description page..
What Is The Cost of WordPress Web Templates ? Usually, a WP template with a single site license will be priced at nearly $60. Of course, the end value normally is defined by the feature, UI components, and extensions that are in the product’s pack. When it comes to multipurpose WP designs, each one will be priced at $90 or more. Even though these prices sound quite fair, you can spend less on getting a WordPress template. How? For these simple reasons, consider cutting-edge bundles. In short, item bundling means providing several items with a discount. Along with it, bundle is a pack consisting of a handful of (or multiple) different products made for the same topic. To illustrate, if you are going to install a web project, there are digital bundles that already consist of such things as themes, fonts, premium extensions, high-res stock photos, and many more. Another obvious benefit of picking bundle is its price tag. Essentially, bundle is priced like a few items it includes. That’s why many folks may think that comparing to the cost of other goods the purchase price looks questionable. What is the key? Well, bundle is at all times a short time offer which explains why it’s so affordable! Why It’s Better To Buy WordPress Designs Bundles? Clearly, purchasing a bundle can save your time. Furthermore, it’s really comfortable for web designers since they will receive all the essential products just off the shelf! Because of this, you won’t have to waste time on looking for every item separately. Making use of these essentials, you will effortlessly make the needed online project. Where To Find More Products? In the event you didn’t find the important products packed in this bundle, don’t hesitate to view the gallery, since there are many other bundles. For instance, you can select from items like CrocoBlock bundle, high quality WP bundles, or mega bundles. Also, MasterBundles gallery also includes bundles with UI elements, textures, patterns, mockups, infographics, images, and psd. As the title of the company states, MasterBundles is a modern resource that offers various ready-made solutions for web designers and developers. Checking out the collection of the company, you will notice a large number of products that are available in a form of a bundle. Due to this fact, it is possible to build the website without running out of the budget. Plus, MB offers their customers to use exclusive coupon codes. Don’t hesitate to apply them to get a promo price! You can save up to 30%! MasterBundles has an entertaining blog page, which may be helpful for anyone who likes to be aware of up to date information about web design solutions, the hottest tendencies, etc. In addition, MB team put up all the hot offers in the blog page, so don’t miss the boat! There’s a simple registration form in the bottom of the blog. Be sure to include your email and be the first person to learn about upcoming sales and bargains.